The Age of Republic series of comics have been delivering readers a variety of different stories focusing on our favorite prequel era characters, from Qui-Gon Jinn to Darth Maul, with the Special delivering three different tales. The issue explores the adventures of Mace Windu, Asajj Ventress, and a team-up between Captain Rex and Jar Jar Binks. Binks might not be the first name the Clone Army would call when in need of assistance, but this particular mission required Binks' more diplomatic skills. At one point in the book, Rex is ambushed by two droids, only to see them cut in half, with a lightsaber-wielding Jar Jar emerging from the shadows. This, of course, wasn't Binks' personal lightsaber, but rather explained how he saw that Laan Tik had dropped it so he had picked it up for safekeeping. Then, in true Jar Jar fashion, he promptly fumbled the saber and dropped it. The narrative ultimately served as a humbling experience for Rex, as he had dismissed Jar Jar and his abilities on the battlefield, while also demonstrating the Gungan's bravery when push came to shove. Throughout the history of the saga, Jar Jar is arguably the most controversial character, not for what he does in the films but for the reception he has received from fans. Immediately after his debut in The Phantom Menace, Star Wars fans who grew up with the series were disappointed, as they were now adults and didn't enjoy such a whimsical character. Binks' role was reduced in the two subsequent films, despite his character earning multiple promotions in the political realm. In the 2017 novel Star Wars: Aftermath by Chuck Wendig, one scene features a street performer who claims to have formerly been in politics, though after being manipulated by those closest to him, allowed the Empire to take power. With society blaming him in part for the expansion of the overpowering organization, he has taken to the streets to dance for money. While this novel is the canonical fate for the character, this Star Wars: Age of Republic Special at least gives fans of the Gungan a momentary glimpse of his heroism. Star Wars: Age of Republic Special #1 is on sale now. 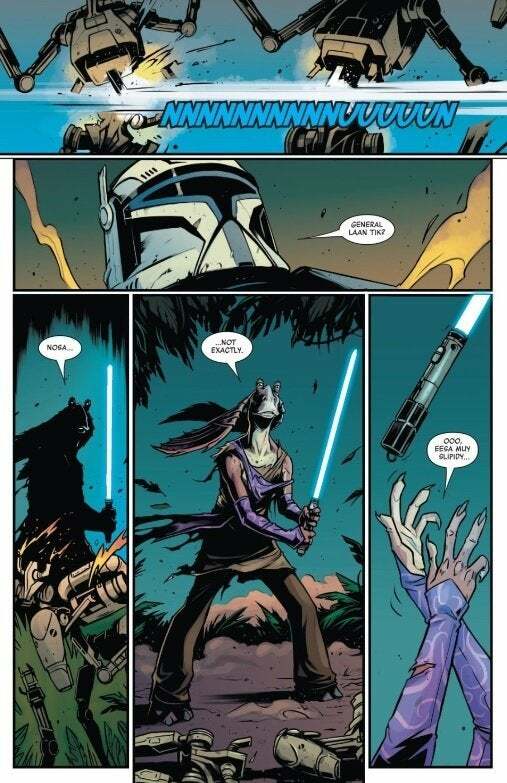 Are you glad to see Jar Jar with a lightsaber? Let us know in the comments below or hit up @TheWolfman on Twitter to talk all things Star Wars and horror!